Zeus is a 1 year old Pit Bull/mix, who is a very muscular 58 pounds. 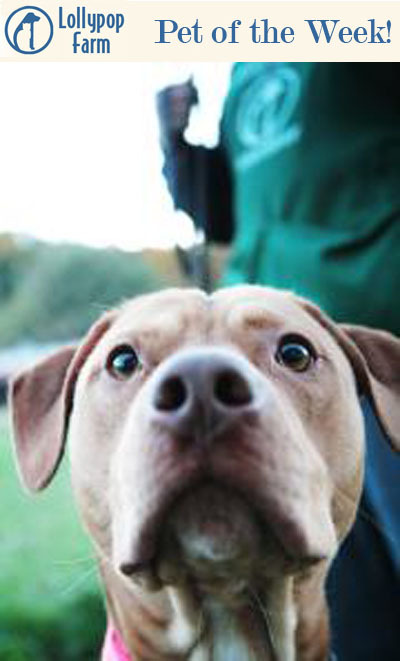 Zeus came to Lollypop Farm in October because his owner could no longer afford to keep him. He is a bit shy around quick movement, but quickly warms up and is eager to get outside. Zeus loves going for walks, takes treats with a big slurp and has lots of energy for playtime. Training is recommended, and a group class might be too distracting for him, so our staff trainer will schedule a private session for Zeus and his adopter at a discounted rate. This young boy is quite playful and will need to meet all resident dogs to make sure they will be buddies. A home with children over the age of 16 is suggested. Zeus can’t wait to work with his adopter to make him the best he can be! Penelope, the cat from last week, is still waiting to find her new home.